Ensuring strategic interest or catalyst for regional military hegemony? On November 28, reports quoting the US State Department spokesperson confirmed that Saudi Arabia has signed a letter of offer and acceptance with US’s Lockheed Martin for procurement of the Terminal High Altitude Area Defense (THAAD) missile defense system at a cost of around US$ 15 billion. The development follows a State Department press release confirming the willingness to sell THAAD by the US to Saudi Arabia in October. Under the deal, Saudi Arabia comes closer to acquiring "44 Terminal High Altitude Area Defense (THAAD) launchers, 360 THAAD Interceptor Missiles, 16 THAAD Fire Control, and Communications Mobile Tactical Station Group, seven AN/TPY-2 THAAD radars, and associated support equipment". The latest development on the potential sale of the advanced THAAD system by the US to Saudi Arabia thus serves a host of political, military and economic goals of mutual interest for the two strategic partners. The current report specifically focuses on the political and operational implications of the Saudi procurement of the THAAD system on the regional military balance. According to the SIPRI report, Saudi Arabia emerged as the second largest arms importer in the world comprising roughly 10 percent of the global arms imports between 2013-17. In the same duration, the US emerged as the largest arms exporter comprising roughly 34 percent of the total global exports. Estimates by SIPRI indicate that the arms trade between the US and Saudi Arabia is estimated to be roughly USD 5 billion in 2016-17 alone. Furthermore, the latest announcement of the potential sale of THAAD follows immediately after the announcement by Germany among other EU states to halt all arms sale to the Kingdom citing the extrajudicial killing of the Washington Post columnist and journalist Jamal Khashoggi in the preceding month. Despite this, the US continues to be the largest exporter of weapons to the Kingdom and has shown no indications of suspension of arms sale to Riyadh. Keeping in mind this trend, the US, which already has the largest share of the Saudi defense pie, may likely witness a nominal surge, especially in the backdrop of suspension of arms sale, albeit temporarily, by some EU states. Moreover, reports indicate that the latest visit by President Trump to Saudi Arabia has resulted in potential arms trade worth roughly US$ 110 billion over the next few years comprising a wide array of military hardware aimed at boosting the Saudi military capabilities. The aforementioned details indicate that arms trade is thus one of the most critical components of the Saudi-US strategic partnership. By signaling the announcement of the deal, US has indirectly hinted at its commitment to continue to bolster its ties with the Kingdom. 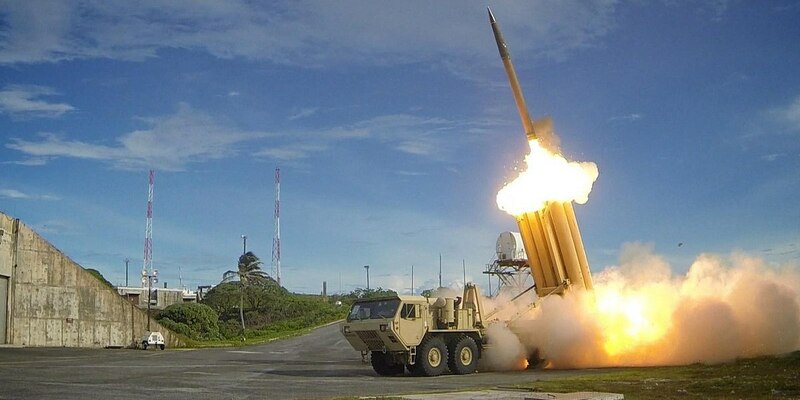 The THAAD system is expected to be compatible with the existing Patriot SAM system as well as other US/NATO systems deployed by the Saudi defense forces. This view is further bolstered by the fact that an array of platforms in the Saudi arsenal are of American or NATO origin and have already been deployed by the US and its allies in certain critical geopolitical hotspots like South Korea. It thus facilitates a more effective, layered approach to air and missile defense and is expected to enhance the development of the Integrated air and missile defense battle command system on the lines of a similar program currently being tested in the US. This capability was unlikely in case of the induction of the Russian S 400 system. The issues relating to maintaining the confidentiality around the technology used in the military platform also remained a pressing concern, hampering the overall operational capability. Furthermore, the UAE, which has already deployed the THAAD may potentially seek a joint command and control mechanism aimed at achieving a more comprehensive coverage of vital GCC installations against aerial threats posed by Iran through its extensive ballistic missile arsenal. This, coupled with the potential formation of the ‘Arab NATO’ in the near future, is likely to significantly augment the overall AD capabilities of the member nations which, once operational, is expected to enhance interoperability which is a crucial element in attaining a network centric warfare capability among the member states. Moreover, the induction of THAAD is likely to ostensibly nullify the single largest conventional military threat posed by the extensive Iranian missile program. Precedence of missile launches by the Islamic Republic indicates that majority of the ballistic missiles were launched from Kermanshah in western Iran, with the deployed arsenal comprising primarily of short and intermediate range missiles ranging from 300- 2000 km. Keeping that in mind, the THAAD system thus holds an operational edge over the Iranian capabilities, further widening the conventional military superiority in favor of the Saudi-Emirati forces against that of Iran. With this in mind, the acquisition is likely to impose an economic burden on the Iranian military industrial complex which is likely to be forced to develop missiles with effective counter-measures aimed at circumventing the THAAD system. This, in turn, is likely to require scaling up the allocated budgets, thus significantly straining and potentially delaying the missile program given the economic difficulties the Tehran regime faces in light of the ongoing economic sanctions. Interestingly, the short range missile arsenal comprising the Fateh 110 and Shahab 1 which have been frequently used in cross border attacks by the Houthi rebels to target Saudi installations have been adequately tackled by the existing Patriot SAM system. Operational relevance against Houthi Missile attacks? The Houthi missile strikes targeting critical Saudi installations, however, are likely to continue nonetheless, irrespective of the addition of this area defense platform. This is primarily because of the defensive nature of the system which has a relatively lesser deterrence value. Moreover, the Patriot system which has proved adept at handling the Houthi arsenal is likely to continue in its role, while the THAAD deployments could serve as a second line of defense. The relatively short distance from the source of Houthi missile attacks (Saada governorate in northern Yemen) and the mountainous terrain along the Yemen-Saudi border is likely to hamper the capabilities of the AN/TPY-2 radar which boasts of a detection range of roughly 1000 km depending upon the terrain. It thus remains likely that the system could be deployed in and around central or eastern provinces where the flat desert terrain can facilitate a better detection of hostile projectiles as compared to the rocky/hilly terrain along eastern and southern parts of the Kingdom. The induction of THAAD, a defensive platform, is unlikely to be a deterrent for the Houthi cross-border missile strikes and the outcome of the ground offensive in Yemen will determine the frequency and lethality of these strikes. THAAD, in addition to the existing Patriot SAM system, is likely to facilitate implementation of a layered defense against possible missile attacks and also result in setting up of an integrated air and missile defense battle command system in the Kingdom which will substantially augment its overall AD capabilities. This, in turn, is likely to further the existing disparity in conventional military capabilities in favor of the Saudi forces against those of Iran. The development, at least indirectly, is likely to force Iran to develop more potent counter AD system which in turn could potentially make the program economically less feasible, especially in the backdrop of the current economic sanction the Islamic Republic faces. Finally, in the backdrop of the arms embargo by some EU states, the deal is an assurance of sorts of the ‘all-weather partnership’ between the US and Saudi Arabia which goes above and beyond the Kingdom’s regional ambitions, as long as they do not hinder the larger US interests. He is an Analyst working on Geopolitical and Security issues concerning the Middle East and parts of North Africa (MENA). His academic areas of interest are International Relations, Geostrategic military developments, and analyzing trends in terrorism and counter-terrorism in MENA and South Asia.